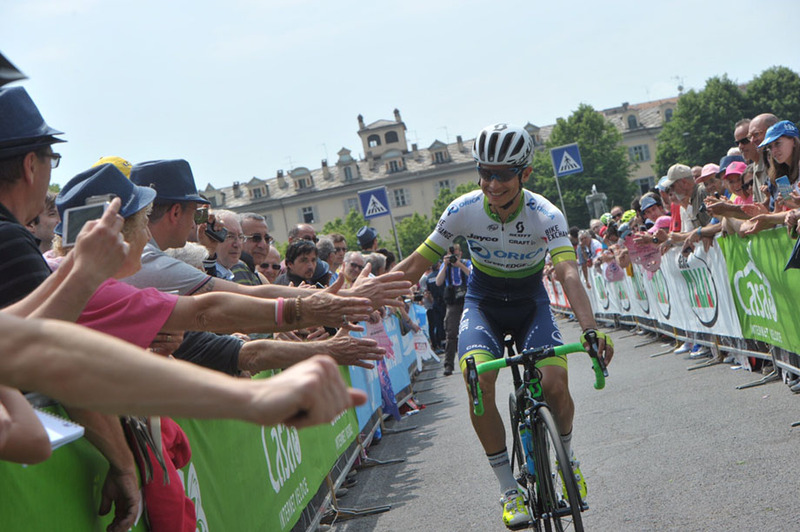 PezCycling News - What's Cool In Road Cycling : GIRO’16: Good Morning Pinerolo! The Cima Coppi, the highest pass of the race, awaits. Stage finish in France. 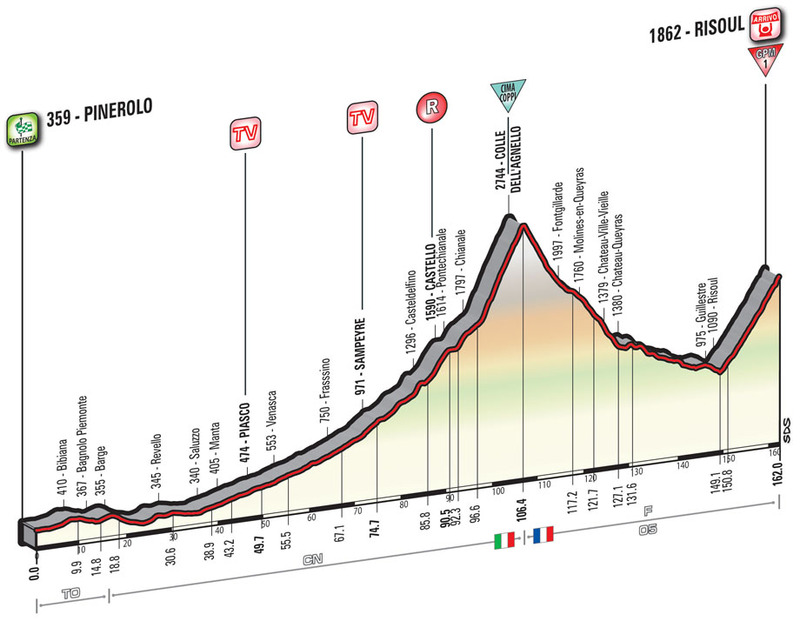 Pinerolo, 27 May 2016 – Good morning from Stage 19 of the Giro d'Italia, Pinerolo to Risoul (162km), featuring the long-awaited Colle dell'Agnello, this year's highest pass at 2744m, and the uphill finish at Risoul in France. The group, 160 riders strong, passed km 0 at 12.42. Did not start: dossard nr 26, Ciccone. During the stage, 80 King of the Mountains points are up for grabs, with time bonuses of 13 seconds and 31 points towards the points classification. 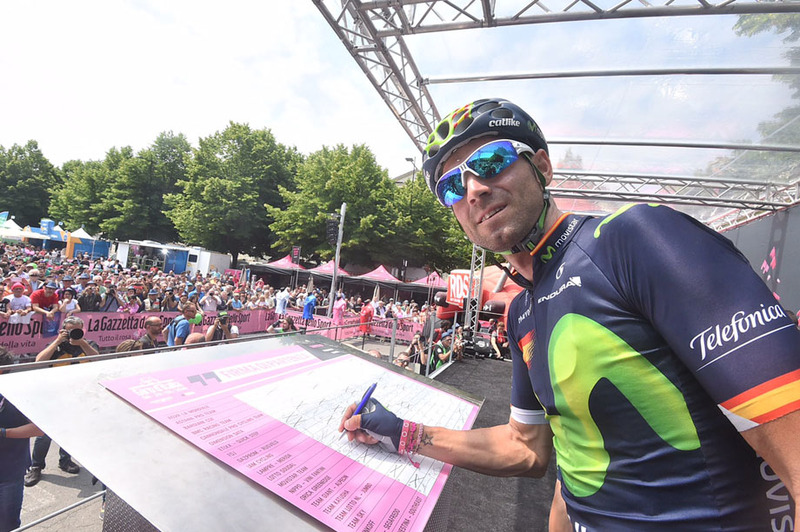 2 - Esteban Chaves (Orica Greenedge) at 3'00"
3 - Alejandro Valverde (Movistar Team) at 3'23"
4 - Vincenzo Nibali (Astana Pro Team) at 4'43"
5 - Ilnur Zakarin (Team Katusha) at 4'50"
This is a high mountain stage featuring a summit finish, and “home” to the Cima Coppi. 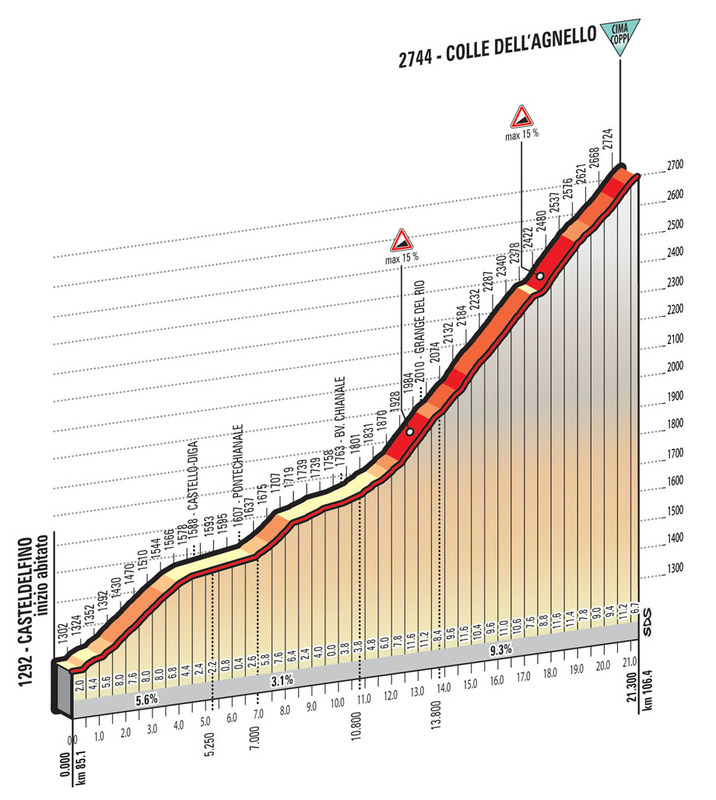 The route runs constantly uphill (on deceptively flat roads) over 80km, all the way up to Casteldelfino. 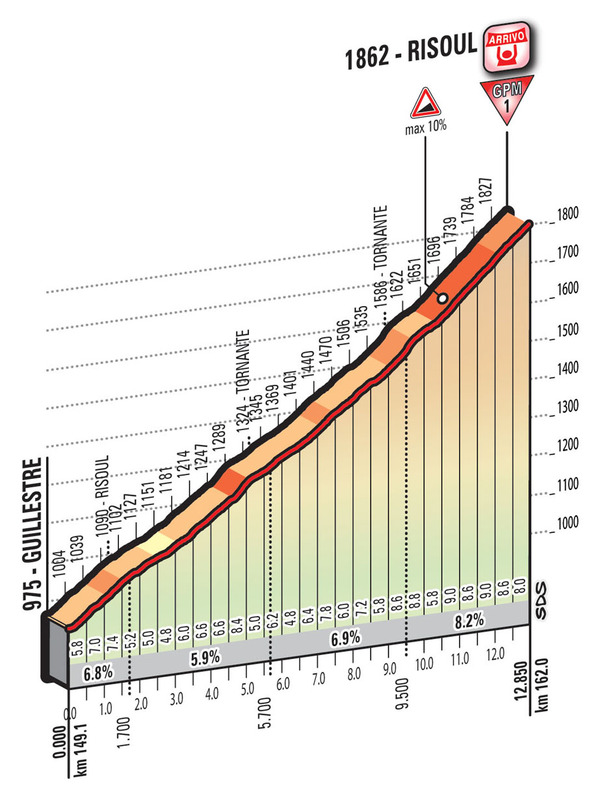 Here the road starts to climb up Colle dell’Agnello (Cima Coppi, 2744m). The following 40km run mostly downhill and lead to Guillestre, at the foot of the final climb. There are a few tunnels around km 135. The last 13km run entirely uphill, with an average 7% gradient and 15 hairpins. The roadway is very wide and well surfaced. The home straight, 150m in length, on a 6m wide asphalt road, has an 8% uphill gradient. The town is known for its “Luserna stone” quarries; this material comes in different shades of grey and was used in the construction of many local buildings, including the feudal complex of Malingri, with its wide gardens. Next on the stage course are Barge, with its distinctive castle and tower, and Revello, with the imposing Cistercian Abbey of Staffarda, built in Romanesque-Gothic style and dating back to the late 12th century. The route crosses the bridge spanning the Po River, entering Saluzzo. The town has retained its original mediaeval district, which rises in the hillside area; it has a wonderful castle (referred to as Castiglia) along with quaint houses dating back to the 15th century and beyond, all built in red terracotta bricks, among flights of steps and narrow alleys. Major landmarks include the early-16-century cathedral, Casa Cavassa (a lovely Renaissance palazzo) and the church of San Giovanni. Saluzzo was hometown to Silvio Pellico (1789-1854), writer, poet and patriot, and to Giambattista Bodoni (1740-1813), engraver, typographer and printer, who designed a famous set of typefaces that was named after him. The route enters Val Varaita, a major woodworking area. Verzuolo, with its grandiose mediaeval castle, was home to the businessman Flavio Briatore (1950). Piasco (intermediate sprint) is a major harp manufacturing centre, and home to a dedicated museum. Next are Venasca, where the road starts to ramp up, Brossasco and Frassino, picturesque villages on the Varaita River, which have preserved their Occitan languages and customs. Sampeyre (intermediate sprint) is the major centre of the valley. It is renowned for active holidays such as mountain biking, along with other traditional activities. This territory is home to a large pine forest, called Pineta dell’Alevé. The artificial lake of Pontechianale, nearby, also referred to as Lago del Castello (feed zone) is a reservoir for the local hydroelectric power plant. The tiny hamlet of Chianale, considered as one of “the most beautiful villages in Italy”,hosted the finish of a stage running from Varazze to Valle Varaita, won by Marco Saligari. The stage finish was moved here from Briançon in 1995 because of an avalanche on Colle dell’Agnello, and victory went to the Swiss rider Pascal Richard. Pontechianale hosted another stage finish in 2003, which Dario Frigo won. The Colle dell’Agnello summit (Cima Coppi, 2,744m) is the third-highest mountain pass in Europe after Col de l’Iseran (2,770 m) and Passo dello Stelvio (2,758 m). A boundary stone marks the Italian-French border. The route enters France right after clearing the summit. The Queyras Valley offers a wonderful view of majestic mountaintops and lovely little villages, in a Regional Nature Park with the River Guil flowing at the bottom of the valley. The first built-up area, Fontgillarde, is a little less than 2,000 metres high and next on the route is Molines-en-Queyras, a popular, well-equipped ski resort. It is home to an imposing castle towering over a rocky spur. The village, at the bottom of the valley between the Vars and Izoard passes, has a lovely stone church. Mont Dauphin at the top of the rocky plateau on the confluence of the Guil and the Durance, has a fortress, built (in pink marble of Guillestre) by the famous architect Vauban (1633-1707), at the end of the 17th century. Today it is a UNESCO World Heritage site where, from along the walls, there’s a magnificent view of the surrounding mountain scenery. Risoul is a large, modern and well-equipped ski area. In 2014, the Tour de France held a stage going from Grenoble to Risoul 1850. 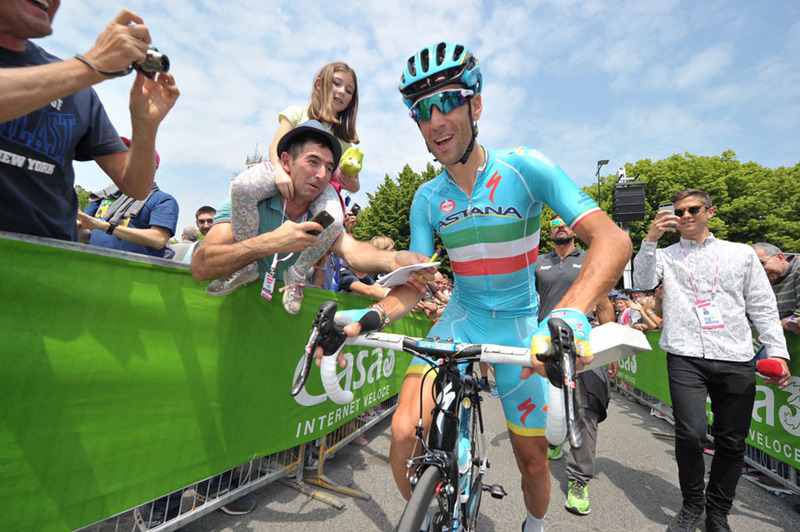 Victory went to Rafal Maika, while Vincenzo Nibali wore the yellow jersey, staking a claim to the final victory in Paris. During yesterday's stage, around 3.6 metric tons of rubbish were collected, 84% of which will be recycled. 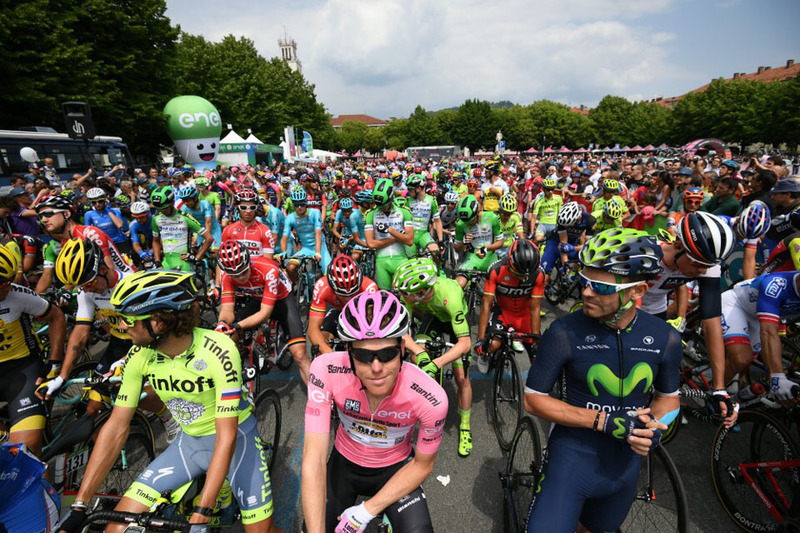 Over 42 tons of rubbish has been recycled so far at the Giro.